A lengthy and heated public discussion at a regular ASUC meeting Wednesday night regarding Student Action’s disqualification resulted in several anti-Zionist and anti-Semitic comments, prompting backlash from the UC Berkeley Jewish community. UC Berkeley faculty, staff, students, alumni, retired staff and community members met Monday to discuss the ongoing housing proposal for the Oxford Tract with College of Natural Resources Dean David Ackerly, who led the meeting. Where are the female professors? Extensive research has been done regarding the effects of female role models on female students. In both high school and college, we see increased retention of women in male-dominated fields of study when they have female role models. The University of California launched its new, single payroll system UCPath at UC Berkeley on Sunday. 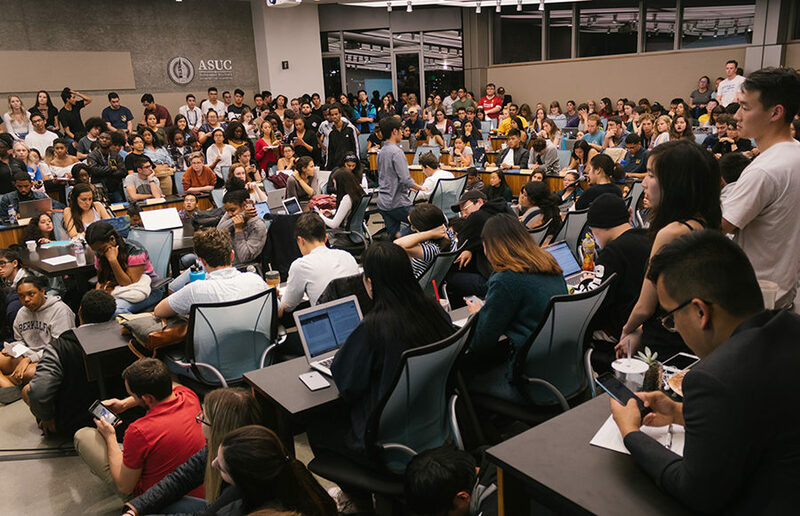 About 70 students and community members, including UC Berkeley Chancellor Carol Christ, students and professors came together to watch Cal Berkeley Democrats and the Berkeley Conservative Society debate taxation, healthcare and minimum wages Wednesday evening. In the aftermath of the New Zealand Christchurch shooting Friday, both UC Berkeley’s Muslim community and that of the wider Bay Area came together, mourning those lost and demonstrating solidarity through an evening vigil, campus community outreach and notes posted on Sather Gate. UC Berkeley announced Friday that the commencement speaker for the class of 2019 will be Wendy Kopp, the founder of Teach For America and co-founder of Teach For All, garnering mixed reactions from graduating seniors. CALPIRG is planning a photo petition event to be held March 14, or Pi Day, as part of its Zero Hunger campaign, which aims to combat student food insecurity. On March 4, the UC Berkeley Division of Equity & Inclusion released a survey to students, staff, faculty, administrators and Postdoctoral scholars featuring questions about the campus climate and how it can be improved.